Past research has indicated that resources and time perspective may influence psychological distress. The goal of this study was to investigate the mediating role that time perspective had on the relationship between resources and psychological distress. Participants (n = 299) completed an online survey measuring their resources, time perspective, and psychological distress levels. 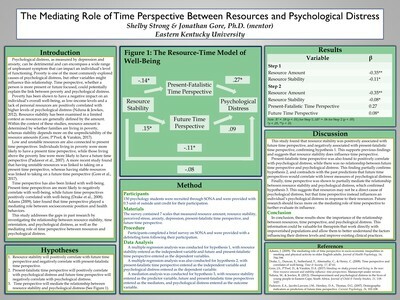 It was hypothesized that (1) resource stability would positively correlate with future time perspective and negatively correlate with present-fatalistic time perspective, (2) present-fatalistic time perspective would positively correlate with psychological distress and future time perspective would negatively correlate with psychological distress, and (3) time perspective would mediate the relationship between resource stability and psychological distress. The results revealed that the model was mostly supported, but there was no link between future time perspective and psychological distress.